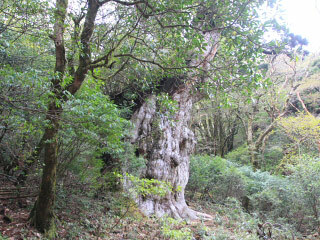 Jomon Sugi (縄文杉) is the largest cedar tree in Japan. It is the main attraction in Yakushima Island. Jomon Sugi is about 25.3m tall and 16.4m girth. The altitude of Jomon Sugi is about 1,300m from the sea level, and the route of Jomon Sugi is very popular trekking spot in Yakushima. The age of Jomon Sugi is calculated from 2,000 to 7,200 years old. The route to the Jomon sugi takes about 5 hours. There are some restroom and water spots in the route. The shuttle bus to the entrance is available at Yakusugi Shizenkan. You can order Lunch Box at hotel or any other stores and they will delivery at the Yakusugi Shizenkan in the morning. 1. use shuttle bus to Yakusugi Shizenkan. 2. use shuttle bus to the entrance of Arakawa Tozando.